Forced Adoption Campaigners have been protesting outside the home of former MP and Children’s Minister Edward Timpson for the last 72 hours in a bid to raise awareness about the practice. Eugene Lukjanenko, who was in the news last year as he battled social services to get his son back after being placed in foster care, has climbed onto Mr Timpson’s roof to ask for his son to be returned to him. Eyewitness accounts from real time video recordings suggest that Mr Lukjanenko was assaulted by Mr Timpson as he tried to remove him from his roof. It is also alleged that Mr Timpson then took Mr Lukjanenko’s phone after he was filmed assaulting him. 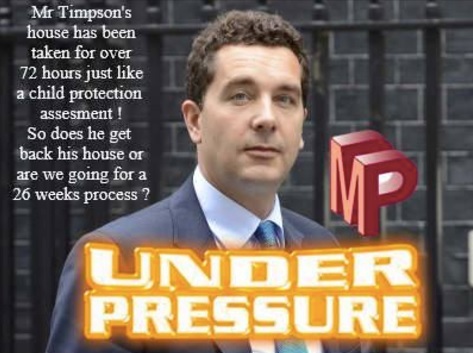 Campaigners wanted to ask Mr Timpson why he refused to look into forced adoption methods in England and Wales and have accused him of self interest. Timpson is alleged to have private financial interests in fostering and adoption agencies. It is understood that Mr Timpson and his family have been moved to a hotel. Police are currently at the scene. Other reports suggest that members of the family are still in the home and have asked the police to remove the campaigners from their land. Thank you to Forced Adoption Exposed for alerting us to this story. This entry was posted in Uncategorized and tagged adoption, forced, protesters. Bookmark the permalink. They have a lawful right to seize this building UNDER THE LAW today, which is Article. 61 Magna Carta 1215 LAWFULLY INVOKED March 23rd 2001.